Click here to download Baby Growing Puzzle Game on iTunes now! A new form of the 2048 game! The addicting numbers game everybody loves - but this time, with personality! Adding character to this phenomenal puzzle, will sure spice up your gameplay. 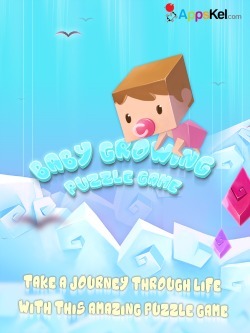 Baby growing allows you to enjoy the mind boggling, nerve-wracking puzzle game a whole lot better! A game spiced with a slice of life, a refreshing twist from your the famous puzzle game! Never has a number puzzle game been so lovelier and adorable! In this number puzzle game, we introduce Mithy - a character full of love and numbers! Join Mithy in her journey through life in this wonderfully crafted 2048 game. 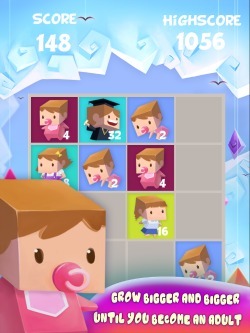 Help her grow from a baby by joining tiles of the same number together! Baby Growing Puzzle is a number pairing game that will surely get you going! When the two tiles with the same number meets, they merge into one bigger number! Every time you slide the tiles, a new tile appears on an empty tile space. 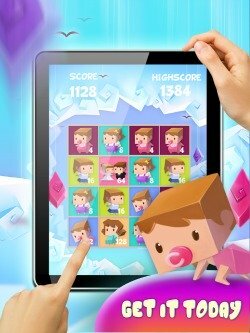 Join the tiles and see the real challenge of this brilliantly addicting game! Make sure that every move counts, making every tile merge into one bigger number until you reach the highest score! Can you come up with a strategy to beat the game? What is the most effective way to reach the highest numbers? Do we slide left? Right? Up? or Down? Take your time, there is no time pressure, but definitely there is a reward of high score to truly treasure! Is it too puzzling? But can’t simply stop because Mithy’s growth is at the tip of your fingers? Can’t get enough of her adorable cuteness? Think! And beat the game with your wit and skills! Or would you choose to randomly slide the tiles, close your eyes, and let luck decide your fate? Journey through the numbers with Mithy. Watch her grow from a crawling baby to a lovely lady! Unlock her full potential with a higher score, and explore all the transformations! Help Mithy find the mysteries of life, maybe even find the love of her life from simply merging those tiles of numbers. It is a game more than just sliding numbers and watching Mithy transform her cuteness exponentially! A game of great mental exercise that will surely hook you up the moment you lay your eyes upon. A puzzle game that will give you a great challenge and refresh your senses to a whole new different level! Can you reach the highest score in the game? Can you slide your way and beat your friend’s top score? Will you able to see the apex of Mithy’s 2048 life? Share the game to your friends, and show off your scores in Facebook! Who among your friends have gone furthest in Mithy's life journey? It's always more fun having more players showing off high scores!